I harmonise in order to reflect, modeling order. I seal the matrix of endlessness with the galactic tone of integrity. I am guided by the power of spirit. Today’s Analog and the CDK are both 1.8; Kin 21. 18.8. “ Mahabodhisattvas are angelic orders who choose galactic transmigration. Bodhisattvic striving is ceaselessly directed toward limitless whole field realization of radiance and luminosity through the entire radially infinite mirror universe of infinite galactic brains and world systems“. For 17 days, we have been ‘occupying’ both the central 7th Mystic Column of the Tzolkin, and the 7th Resonant Moon at the Heart of this Rhythmic Wizard year. This “Resonant Journey” included the beginning of the 5th 113 day cycle: ““Lord of the Dawn Manifests Cosmic Radiance” We entered this cycle on Resonant 8, the day of Melovia’s 52nd birthday [“Happy Solar-Galactic Return!”] and the Birthday of TMQ’s Mother. A few days later were the Galactic Returns of Cole [PVCS 2 Human], and Christine 3 Skywalker. The Chinese New Year of the Dragon began at the mid-point of the 13 Moon Year. Christine made some great observations about that at Stephanie 3 Serpent’s most recent blog: http://1320frequencyshift.wordpress.com/2012/01/25/sun-sounds-and-pyramids/#comments On Resonant 15 [1/24], coded by 6 Warrior, we began the Rhythmic Wizard year’s Return Journey, on the 73rd Birthday of Valum Votan. This week also included the strongest Solar Storm in 7 years. [Tomorrow is Solar Storm, Kin 139 :)] Thanks to Pedrin 4 Warrior who first alerted me of this powerful event. http://www.csmonitor.com/Science/2012/0125/Massive-radiation-storm-produces-spectacular-northern-lights-video Another significant event this week was the unprecedented ‘strike’ of the Internet, which caused a restrictive proposed bill to be postponed-hopefully forever!. Today, 8 Mirror, marks 11 Moons since Valum Votan ascended on Solar 17. Kin 138 [ TMQ’s Galactic Signature] also coded the end of his 49 day Bardo. I’m experiencing more problems/idiosyncrasies as I write this. Thanks so much for your comments, concern, and support. Jannis 7 Moon [whose Kin codes this moon] spent time trying to resolve these wordpress technical issues for me. If this post doesn’t publish properly, I may delete some posts, to see if that clears up the problems. I define in order to nurture, measuring being. I seal the input of birth with the self-existing tone of form. Analog 4 Mirror reminds us that this is the 4th day of the Mirror Wavespell. Kin 17: 4 Earth, also known as Nahui Ollin is “Guiding” us today. Antipode 4 MonKEY coded the “Puncture in the Technosphere“ on 9/11/2001. Today’s Kin 121 and Hidden Power [Kin 140: 10 Sun] frame the beginning and end of the central 7th Mystic Column of this last complete Tzolkin of the 13 Baktuns. 13.8, Galactic Skywalker codes today’s Long Count Kin. 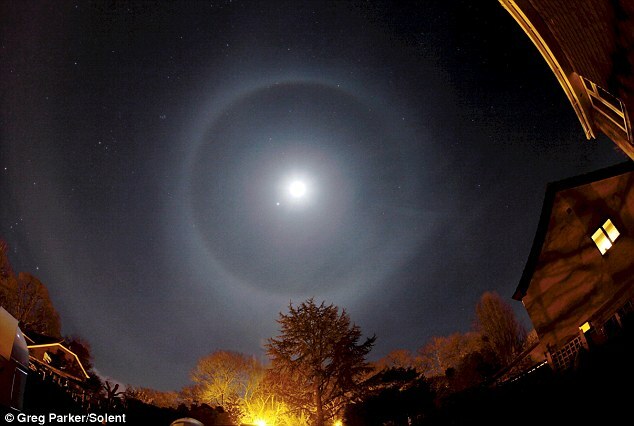 This photo of a rare Lunar Halo was captured on 1/4/2012. 4 Kins/days ago, we entered the 10th Wavespell of Endlessness. 9 Kins/days ago, the long-prophesied year: 2012 began. In 8 Kins/days, the 5th 113 day Cycle: Lord of the Dawn Manifests Cosmic Radiance” begins on Kin 129: 12 Moon [Jan. 17th, Melovia’s Solar-Galactic Return and the birthdate of TMQ’s Mother :)] Valum Votan alerts us to “Anticipate major 12:60 destabilization during this cycle”, as it is “Darkest Before the Dawn“. During this period, it’s vital to remember that Sacred Power is steadily increasing. 149 days from now [including Hunab Ku 0.0], the Venus Return occurs on 9 Moon. During the dawning of 2012, TMQ experienced many synchronicities, most were about the Venus Return. The last day of 2011 was on Rhythmic 19, and the rains that had begun on Overtone 19, after the Earthquake TMQ at 19:19 had continued almost nonstop. New Zealand experienced the heaviest rains in her history, during the month of December] We decided to end our 18 day North Island trip 6 days early, and headed back towards Wellington. During the drive, TMQ noted that the alpha-numeric values of Wellington is 131: 11.1 [Magnetic Monkey, which begins the Tzolkin’s Cycle of Return. We had planned to be on the ferry during New Year’s Eve, to see the fireworks planned at both ports. However, the fireworks and ferry service were cancelled due to stormy weather. Lying awake all night gave ample opportunity to experience and calculate numbers associated with the dawning of 2012. Knowing that our ferry ride would be during the 9.9 watch of 9 Skywalker reminded TMQ that 9 Moon codes the Venus Return on June 6. An exhibit we visited during our trip had said that Captain Cook was sent to the South Pacific to observe the Transit of Venus Return on June 3, 1769 [10 Monkey]. It felt significant that we would be traversing Cook Strait, named for him during that voyage, during the 9.9 Watch that codes the 9.9 2012 Transit of Venus. That is the “Return” of the Venus Transit of 2004, which inaguarated the 7 years of the Mystery of the Stone, and the 8 Years of Harmonic Convergence which ends with the 9.9 Venus Return. These synchronicities, highlighted and shared with so many Dolphins [the first Dolphins I’ve seen in 5 years] were such a beautiful omen for 2012. After lunch in Picton, we walked along the beach during the kin 243: 9 Night Watch, and read a huge plaque honoring Captain Cook. The next day, I learned Captain Cook’s galactic signature: Kin 243: Solar Night, also known as Votan’s “Heart of Nine“. The perfection of the ‘Dawn of 2012’ was sealed, when I learned that the Transit of Venus [which is comprised of two appearances 8 year’s apart] happens every 243 years! The 2004 Transit of Venus was during my Solar-Galactic Return year as Galactic Mirror. 30 [PVCS, 10.4] days later, I began my Kin 243: Solar Night year, during which the 9/11/2004 Prophetic Message and the discovery next day of the 20.12 [Kin 220] crop circle 20 miles from my home activated my Return Journey to OMA. Jannis 7 Moon [whose name calculated via the VV Method equals 220: 20.12] synchronistically/telepathically noted yesterday that Valum Votan ascended 441 days before the 9.9 Venus Return. TMQ is so grateful for yoUR ongoing input into oUR 441 Cube, during her longer-than-expected hiatus from posting. Unfortunately, ongoing computer challenges and time constraints prevent individual acknowledgements today. 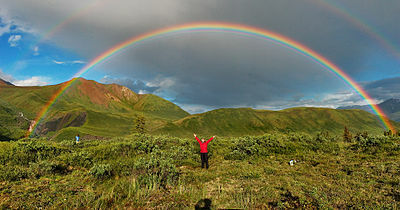 YoUR comments demonstrate a telepathic and loving connection as we begin the penultimate year of 2012, during which we Close the Cycle with the Rainbow Bridge of Telepathy and Unity. The 180 degree Rainbow that appeared moments after the Crystal Night [Kin 103] Solstice in Lake Taupo [=103] was a powerful sign that we will manifest the Rainbow Bridge for the 2012 Solstice. The ‘Ultimate year’ [in our lifetimes] is 2013, when a new cycle begins, as we prepare for and manifest oUR Galactic Synchronization on 7/26/2013, Galactic Seed.